DFI’s Pico-ITX-based, DIN-rail mountable “EC900-FS6” mini-PC runs Linux or Android on an i.MX6 DualLite, and offers 2x GbE, 2x USB, 2x serial, mini-PCIe, and extensive ruggedization features. A reader recently noted our excessive use of the term “rugged,” which is fair enough. In our defense, embedded gear is increasingly tolerant of wide temperature ranges, and to a lesser extent, excessive shock, vibration, and dust and water ingress. From now on, we will no longer use “rugged” to describe a system that has a wide temperature range without also offering other protections. We will, however, continue to apply it to systems like DFI’s i.MX6-based EC900-FS6 mini-PC, which is not only rugged, but quite compact at 143 mm x 96.4 mmx 34 mm. Designed for industrial IoT (IIoT) gateways and other embedded applications, the EC900-FS6 features -20 to 60°C or -40 to 70°C support, as well as 3G, 11ms shock resistance and IEC68-2-64 (3G) compliant vibration resistance (random 5~500Hz). It also has a 10 to 90% RH (non-condensing) humidity range and provides a wide-range 9-36V DC input via a terminal block. The fanless, DIN-rail mountable system has a 15-year lifecycle guarantee. 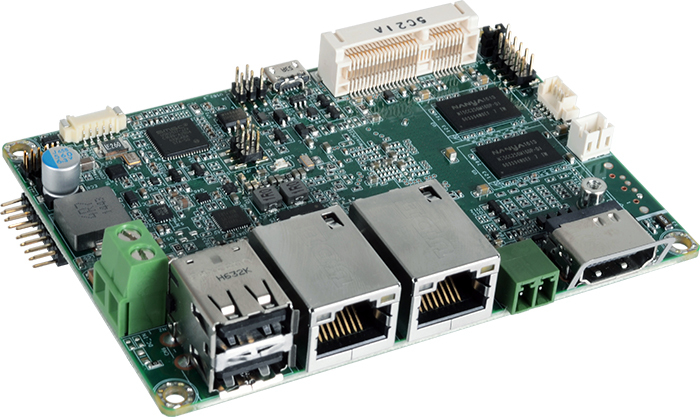 The EC900-FS6 is built around DFI’s Pico-ITX form-factor FS053 SBC, which is equipped with a dual Cortex-A9 i.MX6 DualLite SoC clocked to 1GHz. 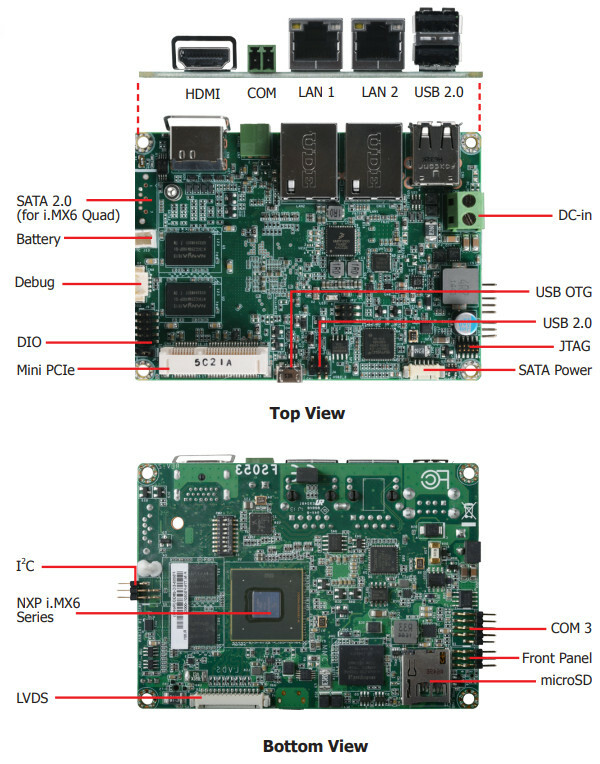 Both the SBC and the system ship with Android 5.1 beta, as well as a stack built with Yocto Project 1.8 beta, both with Linux Kernel 3.14.52. (click images to enlarge)The EC900-FS6 provides 1GB or 2GB of DDR3L, 8GB or 16GB of eMMC, 4MB NOR flash, and a microSD slot. You get dual GbE ports (Atheros AR8033-AL1B and Microchip LAN7500-ABZJ controllers), as well as dual USB 2.0 ports and internal USB 2.0 and USB OTG interfaces. 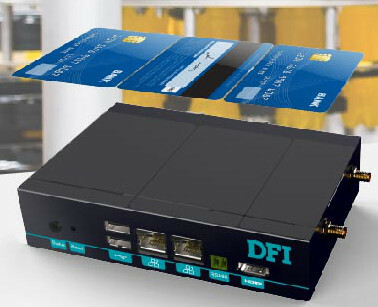 The EC900-FS6 is further equipped with an HD-resolution HDMI port, 4-bit DIO, a UART console, and RS-485 and RS-232 interfaces deployed via 2-pole terminal blocks. A mini-PCIe slot is accompanied by dual mounting holes for WiFi antennas. Other features include a watchdog timer, a reset button, and a status LED. The EC900-FS6 appears to be available now at an undisclosed price. More information may be found in this EC900-FS6 announcement and datasheet (PDF). This article originally appeared on LinuxGizmos.com on August 29. This entry was posted in CC Blog, Industry & Enterprise, Product News and tagged ARM, IIoT, Industrial IoT. 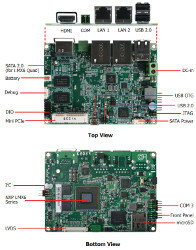 Pico-ITX, IoT, Mini-PC, rugged systems by Circuit Cellar Staff.